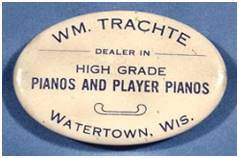 William F. Trachte was born in 1859 and became a very successful Watertown businessman. He was in partnership with G. A. Trayser at one time (Trachte & Trayser) and at another he was the sole proprietor of a piano, organ, sewing machine and bicycle store on Main Street. At the latter, he specialized in the sale of parlor pump organs which were a popular item at the time [WHS 005 217]. He and his wife, Emma, were quite musically inclined and both were proficient playing the organ and the piano. When an organ was sold, a gilded label with the "Trachte" name was affixed to it before it left the shop. William and Emma wanted to be sure everyone knew where the musical instrument was purchased. Emma was also proud to tell buyers that the purchase of an organ also included 10 free lessons. Emma would have the buyer come to their home on South Third Street where a Trachte organ stood proudly. That organ was manufactured by the Raymond Organ and Piano Company of Cleveland, Ohio, and over the years the organ was played by three generations of the Trachte family. There were several different ideas as to where the store was located in downtown Watertown [WHS 005 218 ], [WHS 005 219 ], [WHS 005 220]. over time and it is gleaned from the Watertown Gazette. (“Trachta” is indeed used in the ad, not Trachte. No address given). I find no ad for T&T before this date so assume that the placement of the new ad is close to the time of the founding of the new business partnership (as listed in the 1887-88 city directory). Cor. Main and 3d Sts. Now is the time for the ladies to secure bargains in this line of goods. We quote no prices, but guarantee to suit you in this respect. Come and see us. After the dissolution of T&T, they became competitors in dress goods (dry goods) and were located on the same block. Every week they both had ads in the Gazette, normally at the very top of the same page, with the Trachte ad on the left side and the Trayser ad (“I lead while others follow”) on the right. I have added to my stock a large and well selected line of PIANOS and ORGANS, such as never was exhibited in Watertown before. A cordial invitation is extended to each and everyone to visit my store and examine my goods. Insist upon seeing the ‘Malcolm Love Piano’ with the Phelp’s Harmony attachment . . .
216 Main Street, Watertown, Wis.
Blankets, Ribbons, Notions, Corset, etc . . . The 1897 city directory lists Wm. 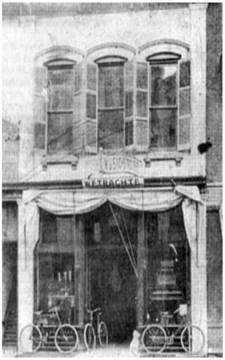 Trachte, re-established at 108 Main, as seller of pianos, sewing machines and bicycles. This has to be the location of the photo submitted by Bill Trachte. Isn’t this, in part, where Keck’s is located today? In the same 1897 city directory Keck’s is listed at 110-112 Main. The 1899-1900 city directory lists 108 Main, pianos and organs. The above Kreitzman image is the earlier of the two. Emanuel G. Wetzel (1871 - 1934) was affiliated with the Trachte firm, being in charge of its music department. Born in Wilton, WI, he previously attended Northwestern College in Watertown and for a time was a parochial school teacher. He later moved to Jefferson and was in charge of the music department of the C. F. Bullwinkel Company of that city [Jefferson Banner, 08 17 1934]. 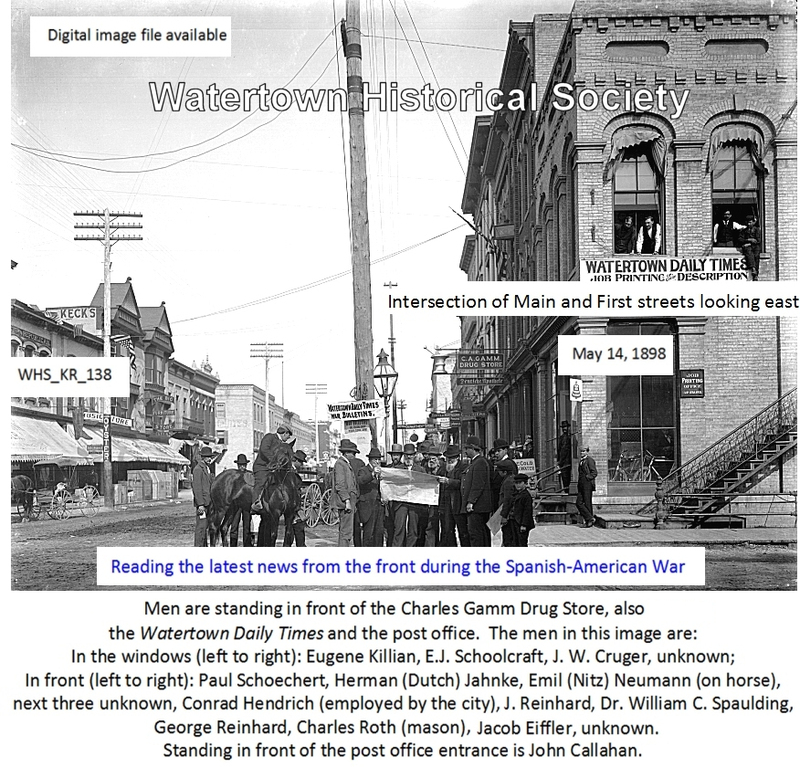 I’ve reviewed the set of Kreitzman images and note that in #045 of the set a number of store fronts can be seen in the background of a parade event on Main. A store front perfectly matching the “unknown” one submitted by Bill Trachte can be seen. 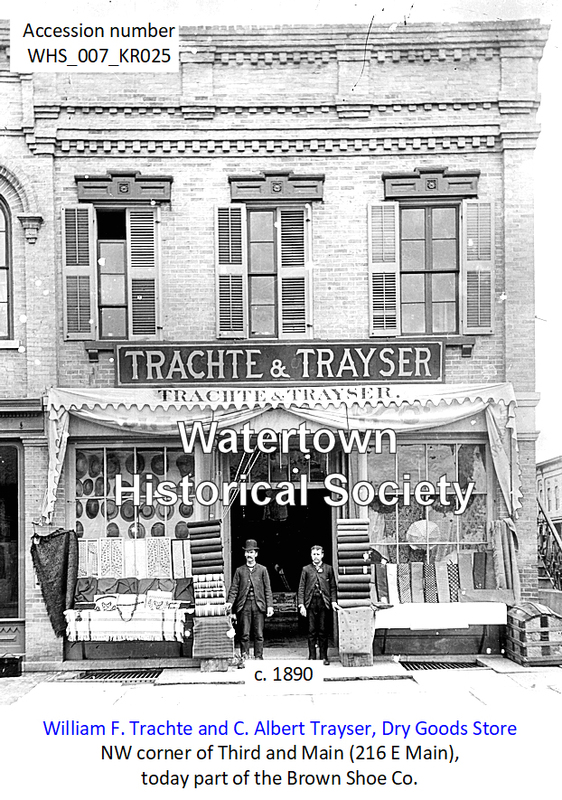 It is to the east of a building clearly identified as “Watertown Republican” and according to the 1898-99 city directory the Republican was located at 106 Main. In Kreitzman image #074 of the set a number of store fronts can be seen less distinctly in the background of a different parade event on Main. But it can be made out that the building that would be 108 has a sign hanging out over the walk that say “Music Store,” and it is the very same sign as shown in the above right-side image. This store is adjacent to another with the lettering “Kecks.” The 1898-99 city directory lists Kecks at 110-112 Main Street. 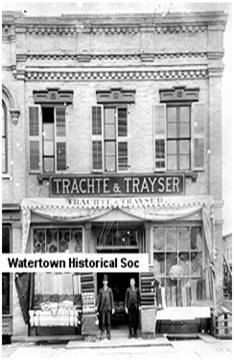 Trachte & Trayser dry goods store was located at the corner of Third and Main (216 Main). After the dissolution of T&T, the Trachte dry goods and music store remained at this location until relocated as the Trachte Music Store at 108 Main. The Trayser dry goods store opened at 208 Main. Oconomowoc store. 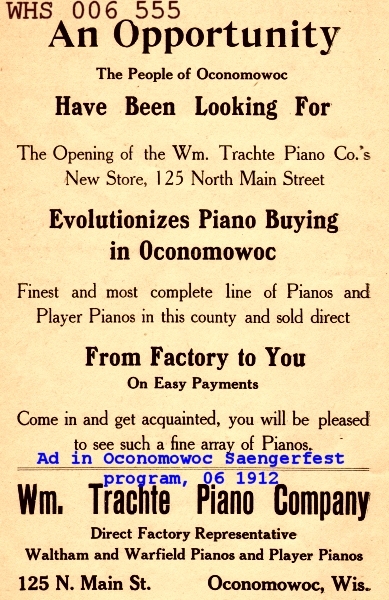 Ad in program of 1912 Saengerfest singing festival held at Oconomowoc, WI.